This is manufacturing project for FairCoin-based “circular economy”. Its goal is to start small-scale production of radio devices for independent FM broadcast, for all kind of alternative and free communities. The plan is to have it funded mostly in FairCoin and to sell the products also mostly via FairCoin and FairCoop channels. It will increase the use of FairCoin outside of current population. By advertising products mainly through FairCoin-based channels. By encouraging buyers to pay in Faircoin via BOTC or Getfaircoin (if it starts working quickly and efficiently). By having collective members paid in FairCoin. By limiting fiat money circulation to the absolute necessary limit (strictly to payments for external goods and services that cannot be acquired otherwise). I am looking now for initial funding (in FairCoin, preferably) through donations, loans or investments, to develop the project until it will be able to sustain itself, which will take up to 5 months. Full information, budget estimates and the road map are published here: Free FM rig manufacturing project. You are invited to ask questions, make comments and of course to donate directly. For direct contact information, see at the bottom of the main document. Looks like a nice idea! So would this be 'pirate' radio, using existing radio bands, or does it use frequencies which are unused by existing radio transmissions? Default design uses standard FM band 87-107 MHz, but it can be easily adjusted. Down the development plans there are rigs to cover 1-250 MHz, as that is the spectrum that can be digitally generated by Raspberry Pi cards. Gladly. Dedicated Faircoin address is: fGiaHzezy3cPRDruSTfkYuFmHHxVR2ndwG More details in the main document. Coopfunding is on the list, of course. I started from here, as this is the environment I know. @Petros in case this helps: There is a guy near us named David Klann who has worked on our local community DIY radio station, and who has created a kit for setting up this kind of station. Look here for more info: http://opensourceradio.org/index.php/Main_Page. Thanks, Lynn, Bob already dropped it for me on Telegram. It is a very good complementary source, as they are focused on the studio side. I believe that the users will be very interested in it. If/when we get to start making audio chain hardware, it will be great reference source for us as well. A tope. Celebrem la proposta i la sinèrgia que pot construir a l'ECO La Experimental. Des de Ràdio Autonomia ens sumem a l'experiència de forum i veiem molt interessant la proposta, replicable o enxarxable amb altres espais cooperatius i projectes autònoms de comunicació. Cool. I will keep you updated. Yes, I think it's an excellent idea Petros, and should contribute to expand Faircoin among the radioham community, that is a great channel for this kind of thing. Bravo! Thanks, @migueli, for your nice comment. So far there is no practical feedback from FairCoin ecosystem to support the idea, but I am of good hope. I'm just a newcomer and I haven't a single faircoin yet, but I will try to raise the issue as much as I can. I think that projects should get fundings depending basicly on 1)Intrinsic value and 2)Potential to expand the FairCoop idea, and yours meet both points. It is my pleasure to inform that today, 25th of January, I run complete and successful test of the FM stereo rig Zagros Mark III. -- Main unit ordered from diy-electronics.com (model FM008) with the IC based 500 mW RF amplifier (same source). -- Minimal half-wave dipole (2 * 75cm) on the 75 ohm cable and BNC connectors, installed indoor at the side of the bookshelf, at the third floor of the stone-made building (block #2 in Prosfygika).The antenna was not optimised, tuned nor balanced. -- External power from a 12V acid-lead battery via L7812cv stabilisator. 12V is maximum nominal voltage accepted by the rig. -- Sound source: laptop audio card through male-male stereo cable. -- Simple analog battery handheld radio (telescopic antenna). On internal power, the reception was limite to direct line of sight of the flat windows (both sides), with some reflected signal vailable in front of block #1 and behind block #3. Handheld radio was more sensitive, but also was easier to be confused by interfering stations. On external power the reception was better in the first area, except for some blind spots (due to antenna location). Reception was arratic between block #3 and in front of #1. Some reflected signal was received at the stairs behind block #4 and by the steel fence of the hospital (steel rail and fence probably providing some secondary resonance). During the weekend I plan to run more tests, using outdoors GP omnidirectional antenna and directional halfmoon dipole (ready made). It works. 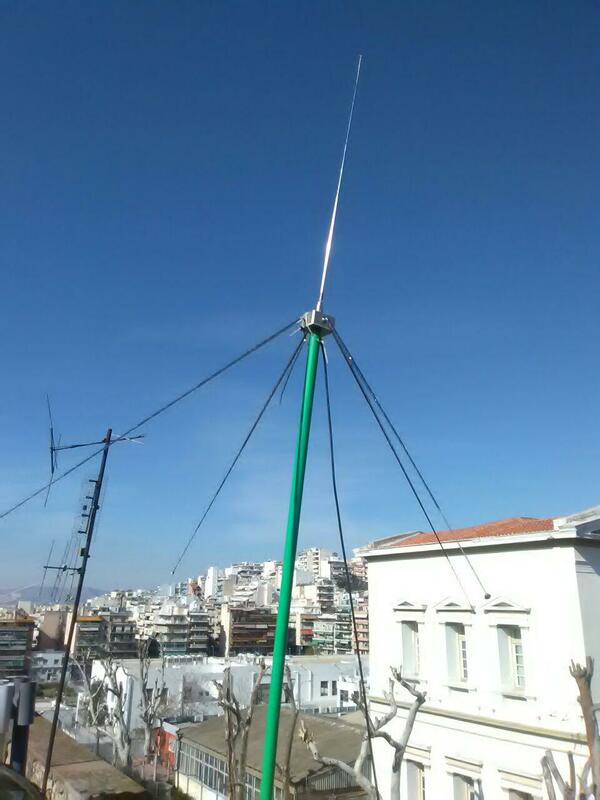 We have the installation that can possibly (with good antenna and possibly some 2-5 Watt boosters) provide all functionality we plan for or radio products. After successful weekend tests I will proceed to start making presentations and raising investment funds. Tomorrow I will provide pictures of the installation. Zagros Mark III stereo FM rig. A set of annotated pictures. Now we are ready to start investment process. Anybody keen and able to support the project? We have received first Faircoin donation! 20 FAIR annotated "New Deposit 2065" -- Thank you. To get the full funding for radio lab and manufacturing, we need 99 more donations like this one. Thanks @Nikola for 41.66666666 Fair! 97 more and we are good! -- 83 Mario108, thank you! Folks, we are getting there! Hi it sound promising to provide such FM rig. And If your radio station project available to send faircoin payment code via radio signal outside the internet networking, it's would be great!